Appeared in 25 games, all out of the bullpen, generating a 2-2 record with a 3.54 ERA … Totaled a school record 14 saves, breaking the previous record of 13 set by current student assistant Colby Suggs in 2013 … The 14 saves tied for the second-most in the SEC and 14th in the nation … Threw 48.1 innings and struck out 59 batters, the sixth-most on the staff … Gave up just 19 earned runs and walked only 14 for a 4.21 strikeout-to-walk ratio … Held opponents to a .154 batting average, the lowest on the team for the second-consecutive season … Made 11 appearances in SEC play, tying for the most on the team, throwing 23.2 innings and 27 strikeouts, while corralling seven saves, the second-most among all SEC pitchers … Made six appearances in the NCAA Tournament, four in the College World Series … Set the school saves record against Oregon State (June 26) in game one of the CWS Final, throwing a scoreless ninth inning and striking out two on 15 pitches … Earned his first save of the year in a 1-0 victory over Arizona after pitching the final 2.1 innings and retiring seven of the final eight batters … Went a career-high four innings against San Diego State (Feb. 24), striking out five and picking up the victory … Earned the save in four-consecutive appearances from April 6 against Auburn to April 14 against South Carolina … Threw a scoreless 6.2 innings during streak with four combined strikeouts … Had a season-high five strikeouts four times (at San Diego State; at Ole Miss – March 29; at Mississippi State – April 20; vs. Florida – May 25) … Earned three saves during the postseason (vs. Dallas Baptist – June 3; vs. Florida – June 22; vs. Oregon State – June 26), striking out two or more in each opportunity … Went more than one inning in 10 of his 14 saves, giving up only a combined four earned runs in those appearances … Suffered from a mild case of mono at the end of April, but came back to earn saves in three of his next four appearances going into the College World Series. 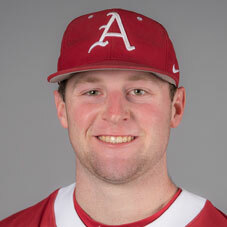 Appeared in 15 games, all out of the bullpen, generating a 3-1 record with a 2.00 ERA, the lowest among all Razorback relief pitchers … Threw 18.0 innings and struck out 31 batters, while walking only 12 and giving up just four earned runs … Held opponents to a .136 batting average, lowest among all Arkansas pitchers … Made five appearances in the postseason, three in the NCAA Fayetteville Regional, holding opponents to no hits and striking out 10 … Combined with Dominic Taccolini and Josh Alberius to throw a seven-inning no-hitter in the SEC Tournament against Auburn (May 25) … It was the 13th no-hitter in school history and first since 2006 … Struck out a season-high six batters over three innings to earn the victory over the Tigers, while throwing a season-high 71 pitches … Earned three wins during the season (at Missouri State – April 11; vs. Memphis – April 18; vs. Auburn – May 25) … Struck out two or more batters in nine appearances, including four or more three times (4 vs. Alcorn State – March 15; 5 vs. Kansas State – April 25; 6 vs. Auburn – May 25). Ranked as the No. 27 left-handed pitcher and the No. 185 overall prospect in the nation by Perfect Game … Ranked as the No. 6 left-handed pitcher and the No. 33 overall recruit in the state of Florida by Perfect Game … 2016 Rawlings-Perfect Game All-America honorable mention and Florida first team All-Region … 2015 Perfect Game Underclassmen High All-America honorable mention … Named most valuable pitcher of the 2016 Perfect Game 18U Florida State Championship … Named to the 2015 WWBA World Championship All-Tournament team and the 2013 WWBA Underclass Word Championship Team … Participated in the 2015 Area Code Baseball Games as part of the Washington Nationals team representing the southeast … Large School All-Area Pitcher of the Year in 2015 and 2016 … Posted a 4-1 record with a 1.73 earned run average, 0.77 WHIP and 114 strikeouts in 60.2 innings in 2016 … Threw a seven-inning perfect game as a senior at Navarre … Florida 7A All-State selection in 2015 … Pensacola News Journal Pitcher of the Year in 2015 … Led the state of Florida with 143 strikeouts and allowed just 22 hits in 68.2 innings … Throws 92 mph fastball … Played summer and fall ball for Evoshield Canes … Threw a complete game one-hitter for the Canes in the 2015 World Wood Bat Association World Championship … Played for head coach Scott Murphy at Navarre High School. Son of John and Robyn Cronin … Has one brother, John Michael and one sister, Jennifer Williams … Majoring in sport management.